Rufus James Marshall was born on May 25th, 1931 in Danville, Illinois. 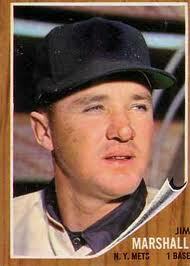 He attended high school in Long Beach California eventually getting signed by the Chicago White Sox in 1950. The six foot one first baseman, outfielder slugged over twenty HRs six straight years in the Pacific Coast League including three 30 plus HR seasons. In December 1957 he was Traded along with Larry Doby, Jack Harshman and Russ Heman to the Baltimore Orioles for Tito Francona, Billy Goodman and Ray Moore. 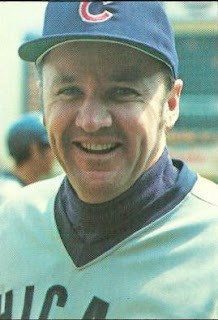 Marshall debuted with the Orioles in April 1958 & then hot his first big league HR against his old White Sox team on May 1st. In August he was batting .215 with 5 HRs & was placed on waivers getting picked up by the Chicago Cubs. In his first game as a Cub he blasted two HRs at Wrigley Field although his team took a 13-8 loss to the Phillies. The next year he was the Cubs back up to first baseman to Dale Long, hitting 11 HRs with 40 RBIs batting .252 in 108 games. 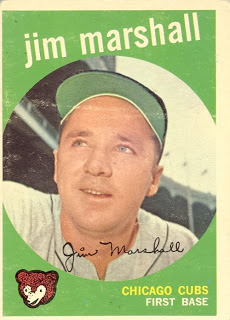 Marshall was then traded to the Boston Red Sox & before he suited up there he was shipped to the San Francisco Giants for pitcher Al Worthington. Marshall played two years with the Giants seeing action behind Willie McCovey at first base & some brief time in the outfield as well as being used as a pinch hitter. On May 17th 1961 he came to bat as a pinch hitter with the bases loaded in the bottom of the 9th inning, in a game against the Chicago Cubs. He drew a walk & drove in the game winning run. On July 13th his 7th inning pinch hit single tied a game against the Pittsburgh Pirates, the Giants won the game later on a Willie Mays HR. On October 13th 1961 his contract was purchased by the New York Mets, making him an original Met. In the first ever game in Mets history Marshall appeared as a pinch hitter drawing a walk against the St. Louis Cardinals. In the second Mets game he got the start & batted in the sixth position, as he doubled & drew another walk. His Mets career started out well as he proceeded to hit HRs in the next two games, making him the first Met to hit HRs in consecutive games. 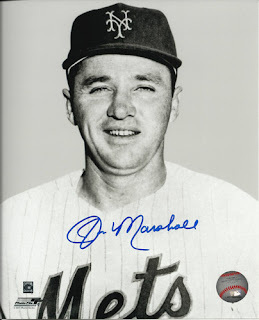 On April 27th Marshall had three hits in a game against the Phillies at the Polo Grounds raising his average to .364. In his next game he hit his third HR, all solo shots as he was among the Mets slugging leaders early on. Strangely on May 6th after just 17 Mets games played Marshall had 3 HRs 3 RBIs & was hitting .344 but was traded to the Pittsburgh Pirates for Vinegar Bend Mizell. Marshall finished out his career that season with 5 HRs 16 RBIs while batting .250. In his five year MLB career, in 410 games, Marshall batted .242 with 206 hits 29 HRs 24 doubles 106 RBIs, a .320 on base % & 139 strike outs in 852 at bats. Retirement: He went on to play in Japan for three seasons with the Chunichi Dragons & later coached there from 1981-1983. In the early seventies he was minor league manager for the Chicago Cubs becoming a coach in 1974. That season he took over as manager after former New York Giants player Whitey Lockman was let go. He remained the Cubs manager through the 1976 season, finishing a best fourth place that year. In 1979 he managed the Oakland A's, going 54-108 there finishing seventh. In his managerial career he was 175-218 (.445 %). Marshall remained in baseball for many years, serving as Senior Advisor for the Arizona Diamondbacks Pacific Rim Operations in 2011.